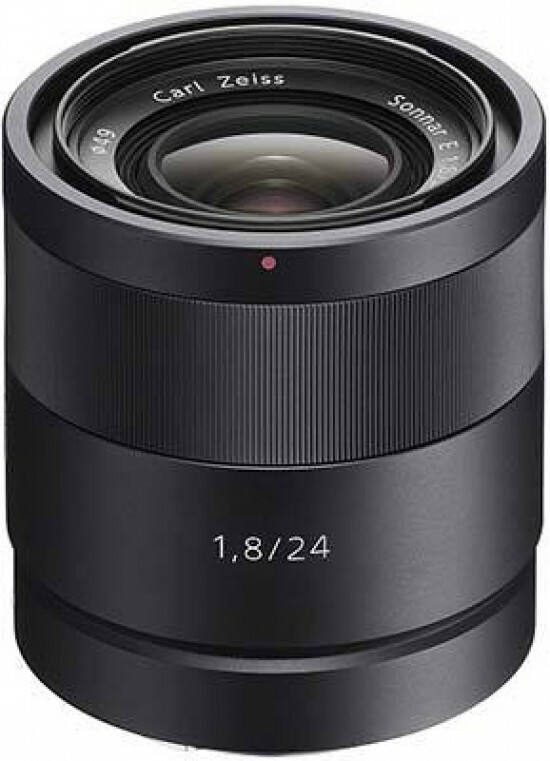 Listed below are some of the rivals of the Sony Carl Zeiss Sonnar T* E 24mm f/1.8 ZA. The Canon EF 24mm f/2.8 IS USM is a new wide-angle prime lens. Boasting built-in image stabilisation and fast and quite auto-focusing, the EF 24mm f/2.8 IS USM is a more affordable but still very capable alternative to Canon's professional wide-angle primes. Read our in-depth Canon EF 24mm f/2.8 IS USM review complete with full-size sample images. The Canon EF 35mm f/2 IS USM is a new moderate wide-angle prime lens. Boasting built-in image stabilisation and fast and quite auto-focusing, the plastic-bodied EF 35mm f/2 IS USM is a more affordable alternative to Canon's professional wide-angle primes. Read our in-depth Canon EF 35mm f/2 IS USM review complete with full-size sample images. The Canon EF 40mm f/2.8 STM is a pancake prime lens for APS-C and full-frame DSLR cameras. Offering continuous AF while capturing video with compatible cameras, the ultra-slim Canon EF 40mm f/2.8 STM retails for just £229.99 / €279.99 / $199.99. Read our in-depth Canon EF 40mm f/2.8 STM review complete with full-size sample images to find out if it's worth the modest outlay. With Spring just around the corner, now is a good time to add a macro lens to your camera-bag - enter stage left the Nikon AF-S DX Micro-Nikkor 40mm f/2.8G, a 1:1 macro lens that won't break the bank. Read our Nikon 40mm macro lens review to find out if it's an essential purchase for Nikon DSLR users. The AF-S DX Nikkor 18-105mm f/3.5-5.6G ED VR is a standard zoom lens that can be used with cropped DX Nikon DSLR cameras. Originally launched alongside the D90 and now bundled with the D7000 and D5100 DSLRs, read our Nikon AF-S Nikkor 18-105mm f/3.5-5.6G ED VR Review to find out if it makes the ideal first lens. The AF-S DX Nikkor 55-300mm f/4.5-5.6G ED VR is an affordable telephoto lens for Nikon DX-format DSLR users. Read our Nikkor 55-300mm review to find out if it's worth the modest investment. The AF-S Nikkor 105mm f/1.4E ED from Nikon is a short telephoto prime lens for full-frame FX DSLR cameras. The 105mm f/1.4 features 14 optical elements in 9 groups and a Silent Wave Motor which provides smooth and fast autofocus with full-time manual focus override. Retailing for £2,049.99 / $2,199.95, read our Nikon AF-S Nikkor 105mm f/1.4E ED review to find out if it's worth the substantial investment. The Nikon AF-S Nikkor 18-35mm f/3.5-4.5G ED is an affordable ultra-wide angle lens. Aimed mainly at full-frame DSLR users, but also compatible with DX bodies, the Nikon 18-35mm f/3.5-4.5 features built-in optical image stabilization. Read our in-depth Nikon AF-S Nikkor 18-35mm f/3.5-4.5G ED VR review complete with full-size sample images. The Nikon AF-S Nikkor 24mm f/1.4G ED is a new professional ultra-wide-angle lens. Aimed mainly at full-frame DSLR users, but also compatible with DX bodies where it provides a focal range of 36mm, the Nikon 24mm f/1.4 is aimed at professional photojournalists and landscape photographers. Read our in-depth Nikon AF-S Nikkor 24mm f/1.4G ED Review complete with full-size sample images. The Nikon AF-S Nikkor 24mm f/1.8G ED is a new wide-angle prime lens. Aimed mainly at full-frame DSLR users, but also compatible with DX bodies where it provides a focal range of 36mm, the Nikon 24mm f/1.8 is a compact, lightweight and affordable lens. Read our in-depth Nikon AF-S Nikkor 24mm f/1.8G ED review complete with full-size sample images.. The AF-S 35mm f/1.4G from Nikon is a moderate wide-angle lens in the full-frame FX format, or a fast standard prime when mounted on a DX body. The 35mm f/1.4 features 10 optical elements in seven groups with one aspherical lens element and a Rear Focus (RF) system incorporating a Silent Wave Motor which provides smooth and fast autofocus with full-time manual focus override. Retailing for $1,799.95 / £1,485.99, read our expert Nikon AF-S Nikkor 35mm f/1.4G review to find out if it's worth the hefty investment. The AF-S Nikkor 58mm f/1.4G from Nikon is a standard prime lens in the full-frame FX format, or a short telephoto when mounted on a DX body. The 58mm f/1.4 features 9 optical elements in 6 groups with two aspherical lens elements and a Silent Wave Motor which provides smooth and fast autofocus with full-time manual focus override. Retailing for £1,599.99 / $1,699.95, read our Nikon AF-S Nikkor 35mm f/1.4G review to find out if it's worth the substantial investment. The Nikon AF-S Nikkor 10-24mm f/4G ED VR is an ultra-wide angle lens for DX-format digital SLR cameras. This affordable lens provides a focal range of 15-36mm, offers quiet and fast auto-focusing, and is housed in a compact and lightweight body. Read our in-depth Nikon AF-S Nikkor 10-24mm f/4G ED VR review complete with full-size sample images. The PC-E Nikkor 24mm f/3.5D ED is the first ever wide-angle tilt-shift lens from Nikon. Designed for studio, architecture and landscape photography, the PC-E Nikkor 24mm f/3.5D ED is a serious investment at £1099.99 / €1642.00 / $1929. Read our in-depth PC-E Nikkor 24mm f/3.5D ED review. The M.ZUIKO Digital 12-40mm f/2.8 Pro is a new fast standard zoom lens from Olympus for the Micro Four Thirds system. Offering a 24-80mm focal length, constant f/2.8 maximum aperture, fast and near-silent focusing, and a manual focus clutch, read our in-depth Olympus M.ZUIKO Digital 12-40mm f/2.8 Pro review to find out if it's the perfect partner for the flagship OM-D E-M1 camera. The M.ZUIKO Digital 17mm f/2.8 was the first Olympus lens for the Micro Four Thirds system when it was launched alongside the E-P1 back in 2009. Offering a 34mm focal length and a relatively bright maximum aperture of f/2.8, this moderate wide-angle lens is still sold in kits with Olympus' more recent MTF bodies. Read our Olympus M.ZUIKO Digital 17mm f/2.8 review to find out if this tiny lens justifies a place in your camera bag. The M.Zuiko Digital ED 12-50mm f/3.5-6.3 EZ is a new standard zoom lens from Olympus for the Micro Four Thirds system. Offering a 24-100mm focal length, fast and near-silent focusing and a variable-speed electromagnetic zoom mechanism, this weather-sealed lens makes the perfect walk-around partner for the new OM-D E-M5 camera body. Read our in-depth Olympus M.Zuiko Digital ED 12-50mm f/3.5-6.3 EZ review. The Olympus M.Zuiko Digital ED 75-300mm f/4.8-6.7 is a new ultra-telezoom lens for the Micro Four Thirds system. Equivalent to a 150-600mm lens in 35mm format, the new Olympus 75-300mm f/4.8-6.7 measures just 70x116mm and weighs only 430g. Available for £799.99 / €899 / $899.99, is this the right telephoto lens for your MFT compact system camera? Read our Olympus M.ZUIKO Digital ED 75-300mm f/4.8-6.7 lens review to find out. The Panasonic LUMIX G 14mm F2.5 ASPH is a wide-angle lens for the Micro Four Thirds compact camera system. Providing a classic focal length for landscapes and street photography, the Panasonic 14mm is both tiny in size and weight, making it a perfect wide-angle partner for the small and compact Micro Four Thirds. Read our Panasonic LUMIX G 14mm F2.5 ASPH review to find out if it's worth adding to your collection. The Panasonic LUMIX G FISHEYE 8mm F3.5 is a fisheye lens for the Micro Four Thirds system of interchangeable lens cameras. Offering a diagonal angle of view of 180 degrees, the Panasonic 8mm lens certainly offers a unique perspective on the world. Read our Panasonic LUMIX G FISHEYE 8mm F3.5 review to find out if it's worth adding to your lens collection. The Panasonic LUMIX G MACRO 30mm f/2.8 ASPH. MEGA O.I.S. is a new macro lens for the Micro Four Thirds system of interchangeable lens cameras. Offering an effective focal range of 60mm in 35mm terms, the Panasonic 35mm lens offers 1:1 magnification and built-in image stabilisation, yet it's small enough to fit in your hand and only weighs 180g. Read our Panasonic LUMIX G MACRO 30mm f/2.8 ASPH. MEGA O.I.S. review to find out if it's worth adding to your lens collection. The Panasonic LUMIX G VARIO 100-300mm F4.0-5.6 MEGA O.I.S. is a new super telephoto lens for the Micro Four Thirds system of interchangeable lens cameras. Offering an effective focal range of 200-600mm in 35mm terms, the Panasonic 100-300mm lens is a perfect fit for wildlife and sports photographers, yet it's small enough to fit in your hand and only weighs 500g. Read our Panasonic 100-300mm F4.0-5.6 MEGA O.I.S. review to find out if it's worth adding to your lens collection. The Panasonic LUMIX G X VARIO 12-35mm F2.8 ASPH is a new premium standard zoom lens for the Micro Four Thirds system of interchangeable lens cameras. Offering an effective focal range of 24-70mm in 35mm terms, the Panasonic 12-35mm lens boasts a fast constant aperture of F2.8, fast and quiet auto-focusing, quality construction and weather sealing. Read our in-depth Panasonic LUMIX G X VARIO 12-35mm F2.8 ASPH review, complete with 60 sample images, to find out if it's a must-have lens for Micro Four Thirds photographers. The Samyang 35mm f/1.4 ED AS UMC is a moderate wide-angle prime lens for full-frame and APS-C DSLRs. The Samyang 35mm f/1.4 is a much more affordable alternative to the Nikon and Canon equivalents thanks largely to being manual-focus only. Read our in-depth Samyang 35mm f/1.4 ED AS UMC review complete with full-size sample images. The Sigma 19mm f/2.8 EX DN is an inexpensive lens for Micro Four Thirds and Sony E-Mount compact system cameras. Retailing for just £169.99 / $280, find out if Sigma's first mirrorless lens is worth considering in our in-depth Sigma 19mm f/2.8 EX DN review. The Sigma 30mm f/2.8 EX DN is an affordable standard lens for Micro Four Thirds and Sony E-Mount users. Officially retailing for £169.99 / $280, find out if this lens is an essential addition to your mirrorless system in our expert Sigma 30mm f/2.8 EX DN review. The Tokina AT-X 12-28mm F4 Pro DX is an affordable wide-angle lens for APS-C DSLR users. Incredibly well-built, the Tokina 12-28mm is a good match for larger cameras like the Canon EOS 7D that we tested it with. Read our Tokina AT-X 12-28mm F4 Pro DX Review to find out if it's worth considering instead of the Canon and Nikon alternatives. The ZUIKO DIGITAL ED 14-35mm F2.0 SWD is the world’s first standard zoom lens to feature a constant f2.0 aperture. It provides an equivalent focal length of 28-70mm in 35mm terms and features the SWD-driven ultra-fast AF system. Part of the premium Super High Grade (SHG) series for Olympus DSLR cameras, the Olympus 14-35mm F2.0 SWD also offers dust-/drip-proofing, a mechanically interlocked manual focusing mechanism, and a large, flower-shaped hood with a polarization filter control window. Priced at $2,299 / £1,999, we find out if the ZUIKO DIGITAL ED 14-35mm F2.0 SWD is the best standard zoom lens that money can buy. The Zuiko Digital ED 50mm f2 Macro is an affordable macro lens for the Four Thirds system. Offering an equivalent range of 100mm on a 35mm film camera, the Olympus 50mm Macro has a constant maximum aperture of f2.0, closest focusing distance of 0.24m and ED lens elements for highest picture quality. Currently priced at around $450 / £450, we find out if the Zuiko Digital ED 50mm f2 Macro is a must-have lens for the Four Thirds photographer.